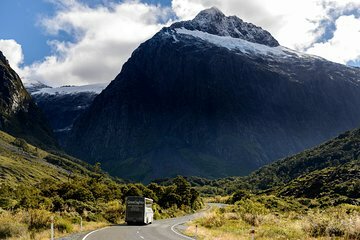 Board your panoramic coach upon hotel pickup in Te Anau, referred to as the ‘Gateway to Fiordland.’ Your full-day tour includes a majestic 1.5-hour Milford Sound cruise within the UNESCO-listed Fiordland National Park. En route to the fiord, your driver-guide motors past the ancient beech forest of the Eglington Valley, pausing at the Mirror Lakes for a leg stretch and photo op. Continuing on through the Upper Hollyford Valley, you’ll be mesmerized by Christie Falls before entering the Homer Tunnel, drilled through the solid mountain rock. Brace yourself for the grandeur of the Cleddau Valley, where you’ll follow a footbridge over the Cleddau River to the Chasm to view the river’s turbulent whirlpools before descending into Milford Sound. From your cruise boat, indulge in the splendor of your surroundings as you glide past waterfalls that splash down vertical, glacier-carved rock walls. Hear commentary about natural wonders such as the postcard-perfect Mitre Peak, which rises 5,551 feet (1,692 meters) from the water. Don’t miss the wildlife such as New Zealand fur seals, bottlenose dolphins and the rare Fiordland penguin. Gourmet buffet lunch is included on board the cruise, before you re-board your coach for the return journey to Te Anau. The missing star is for the food, it was ok. Otherwise the trip was great, we had a cloudy, rainy day but it was still a sight to see. I haven't seen what we got to see on the cruise in pictures. waterfalls everywhere. the pilot was great too, telling us the little stories and where we were and what was coming up. the boat had some awesome spots up front and in the back to take advantage of. they had an upper deck too but i didn't venture up there b/c of the cold weather and rain. A wonderful day trip, the coach driver was very helpful, informative and amusing. Lunch was delicious, but the only criticism I could find was that we missed the first 20 mins of the trip, because we were inside eating Lunch! All in all I would thoroughly recommend this trip to anyone visiting the area, stunning!